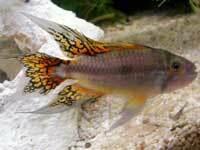 Cynotilapia afra (afra cichlid) are brightly colored mbuna from Lake Malawi Africa. 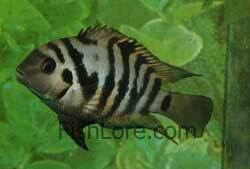 The afra cichlid makes a wonderful fish for any mbuna tank. 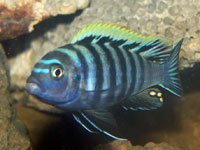 Afra Cichlid Tank mates: Other malawi mbuna should not mix more than one type of Cynatilapia due to hybridization and fighting. Will mix well with labs and Afras. Fish Food: Omnivore, needs diet low in protien and fresh veggies. Gender: Males are brightly colored where females are brownish to greyish. Tank Size:Minimum of 55g Tanks need to be long rather than tall.